PHM is acting as a unified platform of analytics for improving the insights of patients, care managers, and care providers towards population health. Care providers can find outpatients who need primary healthcare interventions. This helps in laying a proactive foundation for improved preventive care and better disease management. With PHM, patients are now getting involved in different patient meeting platforms to fulfill their care goals. They participate actively or passively via remote monitoring means. As per the U.S. Department of Health and Human Services, over 91% of hospitals and approximately 75% of the U.S. eligible professionals use Electronic Health Records (EHR), which is sanctioned for Stage 1 usage. PHM itself encompasses proactive implementation of strategies and interventions to specify the cohorts of people groups across the gamut of healthcare delivery for sustaining or improving the health at the lowest possible cost. Marking a shift from acute care due to electronic data availability, PHM is now focusing on shared accountability provisions to increase its scope. This expansion covers an increasing keenness for data related to other care pathways along with the continuum and formal fiscal agreements for sharing the responsibility. 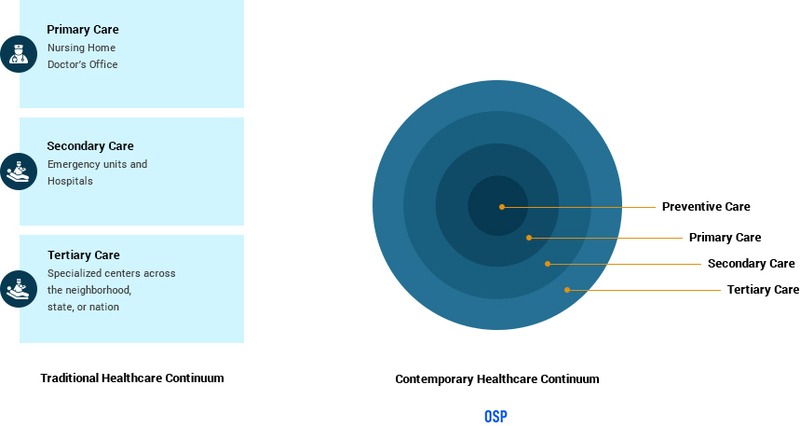 The traditional healthcare continuum encompasses primary, secondary, and tertiary care and is quite requirements-centric, clear, and concise. However, it is based on the fact that there is an underlying ailment or injury. Although useful for treating individuals, it is not for those who wish to prevent health adversity. As per the World Health Organization (WHO), not even 2% of all healthcare resources are geared towards prevention. However, the contemporary continuum includes the preventive care dimension, as shown in Figure 1. Healthcare in the U.S. is complex. What’s more to it is that the level of complexity is increasing as PHM is transforming the traditional hospital-focused approach into the modern continuum of care. PHM needs to be clinically more effective, safer, and more economical. It also needs to deliver more efficient outcomes using fewer resources. This is not an easy job in an acute care-oriented industry. So, in this evolving environment, how can an organization trigger quality improvements and cost reductions? Well, the key is to systematize healthcare delivery step by step. To do so, it is first essential to comprehend the flow of care. Healthcare delivery’s structure is a conceptual framework illustrating how care delivery functions. It splits the existing complexity into a simple model containing domains and subdomains and the care flow among them, as shown in Figure 2. Through this illustration, it becomes easier to comprehend the care delivery process and find out gaps for improvement. 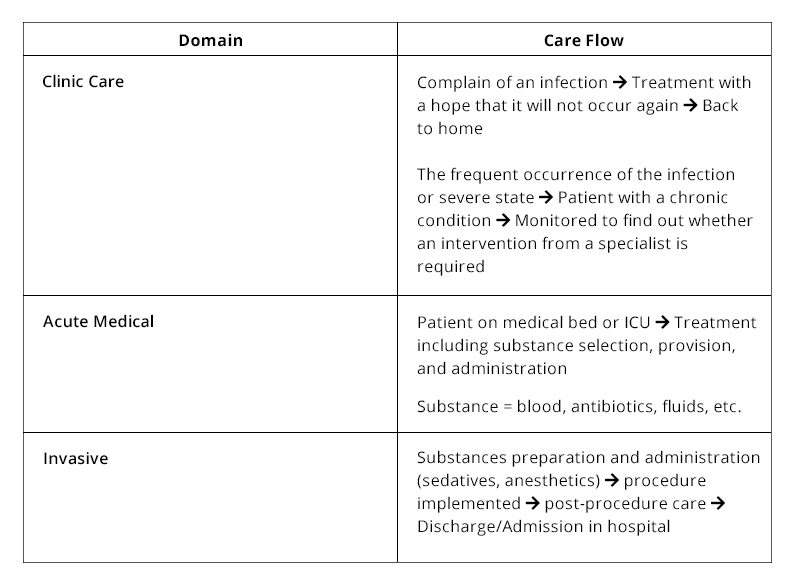 In Figure 2, care delivery starts with screening findings or symptoms. This results in a to a diagnostic examination. This is the time when providers need to decide the right treatment venue for the patient. The patient is then guided to one of three critical clinical management domains namely, clinic care, acute medical, and invasive. Figure 2 shows these as three vertical streams. That is the basic concept of healthcare delivery and care continuum. It as these significant decision points we need to systematize processes in a better way. This can be done by presenting evidence-based knowledge assets, which are indicated by blue and orange boxes in Figure 2. The orange ones denote assets related to algorithms and criteria for prescribing the right tests and care. 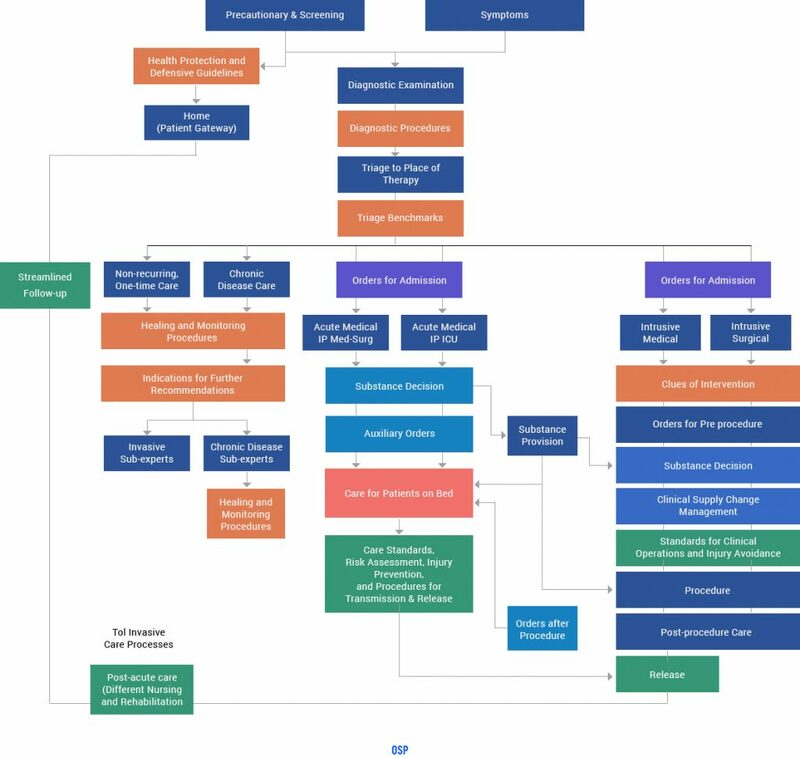 On the other hand, blue boxes indicate case-specific assets for managing the individual in inpatient and outpatient environments, utilizing substances, and implementing care in a standardized order in invasive and routine settings. Using these assets is the key to make decision-making based on uniform, evidence-based medicine. Creating and implementing these strategies is likely to improve the clinical effectiveness and patient care safety. It allows identifying possible chances of improvement to boost quality, patient satisfaction, and control cost. Collaborations with other care sites such as providers, clinics, and other hospitals are necessary to ensure that the population is getting the apt level of care. As per an AHA survey, over 98% of hospital chief executives rely on completely aligning with clinical providers such as physicians. Both parties are accountable for future health outcomes due to which collaborations are ideal for ensuring the same across the care continuum. Hospitals contain the resources for clinical data to minimize unnecessary variation and set up best practices in interventions, while the physicians interact directly with patients to support quality behavior change. Thus, both need to collaborate for improved care, less unnecessary admissions and increased access to proper evidence-based standards. As both the clinics and payers are liable for quality and cost, a collaboration between them tends to improve population care by sharing data, focusing on primary care, and aligning with physicians. Historically, clinics and providers were at the core of the healthcare system. However, PHM has flipped this relation and has made people the core of this system. Therapists, nurses, and doctors assess the patients but are unaware of other types of care that the patient has received. At this point, information from the payer allows a provider to become aware of the treatment history instantly along with the professionals delivering the care, and the recently done tests and interventions. Community-wide details pave the way for a conversation about the care type been received. For instance, if a patient was hospitalized at two different clinics, the provider can easily find out what happened at during those periods and what was the reason to choose two separate facilities. While the provider can get past hospitalizations’ details, the payer can obtain clinical information. So, sharing the combined provider and payer details while aligning the finance and contracts, enables each role players to use the complementary strengths to overcome the care synchronization gap. Motivating providers and payers to work together is perhaps the top priority these days. These incompatible groups have now figured out how to collaborate for improving clinical, fiscal, and patient experience outcomes. The role of healthcare providers is to be a deliverer of high-value care, which translates to streamlining the existing solutions and processes for better outcomes. However, setting up such an infrastructure can be expensive for providers and their institutions, especially for primary care professionals who are wedged financially. Persuading these physicians for a remarkable investment is not that easy. One of the complaints from these professionals is to invest more and get fewer returns to trigger savings that only payers and employers will realize. Payers claim that they are not taking proper care, as they do not invest in resources. Well, this is precisely where the role of payers is. Their role is to build compensation models that are in line with not only value-based care but also provider incentives. In simple words, the models need to be based on outcomes so that the providers or physicians can invest in their resources. Payers are not for being in between a provider and a patient. Payers drive healthier outcomes when they work to develop valuable compensation models. For quite a long time, payers are analyzing a relatively whole set of data related to claims by their members. So, they have developed risk models, examined financial aspects, and obtained a profound understanding of patients who can reap maximum benefits from extra services. Sharing these details with providers can be remarkably useful. On the other hand, providers have started gathering data about their patients, which is usually clinical as well as administrative. Thus, it is likely to provide a richer insight into the historical care records of each patient than what the payer’s claims data offer. When this data is shared amongst payers and providers, the knowledge base will be a complete set to work with for improving the overall care quality. Payer-provider collaboration is likely to result in quickest PHM execution, while payers coordinate with physician groups such as ACOs and IPAs. These groups share the views of the physicians with payers. For value0based care, payers need to encourage providers to systematize, as providers can aid their physicians to provide more comprehensive as well as effective value-based care. Currently, payers and providers are challenged to build effective programs for ensuring high-quality, patient-oriented healthcare to improve patient outcomes efficiently. In the current environment where the healthcare costs are rising steeply and providing valuable care has become more crucial than before, payers, clinics, and providers have vital roles. 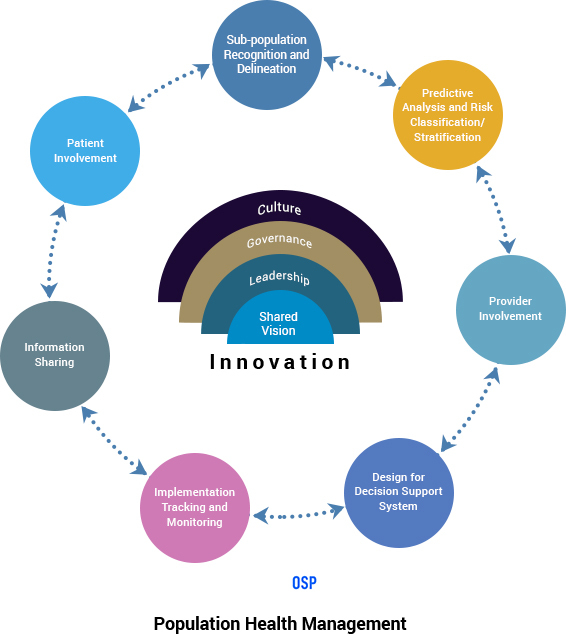 Unless these roles come into action, healthcare transformation is impossible. The need for a nationwide healthcare revolution has initiated a radical change in the existing care delivery and payment model. This change has moved the focus on a fee-for-service approach to pay-for-performance and finally, to value-based care. The revolution has forced the industry to improve the care’s cost-effectiveness as well as the quality. As a result, the healthcare industry is introducing new methods of delivering care, reorganizing their administrative structures, and setting more collaborative workflows. However, in the pursuit of doing so, the PHM is facing a few challenges. Even today, patients lack access to information about different healthcare details, including potential treatments. These uninformed or under-informed patients are likely to skip appointments, continue to live with a chronic condition and remain uninsured. With the new norm of patient-centric care, the ability to obtain and comprehend the health information is indispensable. For improving the health outcomes and facilitating an effective chronic disease treatment, patients need to comprehend their condition and the way to regulate it. This requires a constant touch with healthcare providers. Even the lack of access to valuable care is widespread. Patients having a primary care provider still feel difficult to schedule an appointment on time. This is possibly due to a busy schedule or lack of staffing. All these factors impede efforts to involve patients in their healthcare programs. A face-to-face meet is not needed for each issue but connecting with care providers regularly keeps them informed and seek care instantly when required. According to the Clinical Director of Population Informatics located at Massachusetts, Dr. Adrian Zai, increasing the outreach for engaging patients is required for improving outcomes. Electronic Health Records (EHRs) and Electronic Medical Records (EMRs) are the two critical data repositories. Using them, the nurses and other healthcare professional’s aggregate information related to patients. In 2015, almost 87% of professionals having an office were using these systems. As more and more professionals are using them, they are finding it cumbersome to record data in them. They even feel that the time used in entering data in these systems is so significant that they could have spent that much time with patients. Thus, for many, EHRs are inefficient. Due to such EMRs, doctors keep looking for information to share, while nurses take almost 30 minutes to enter data that is then shared. If the same sharing is done orally, it will take just a few minutes. 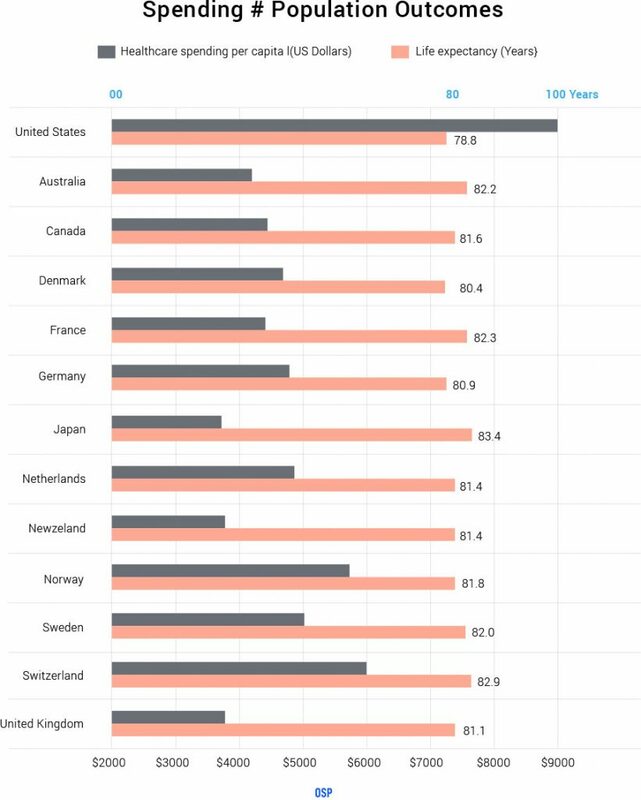 As per a study by the Commonwealth Fund, the total overlay of the U.S for healthcare is the highest than any other high-income nations, and yet it has the worse outcomes and a lower life expectancy. Although the cost is high, the outcomes are not better. Of the countries covered in the Commonwealth study, the U.S. had the lowest life expectancy at birth—78.8 years. Moreover, it performs equally poorly for chronic conditions such as diabetes (third-highest rate for lower extremity amputations because of diabetes) and ischemic heart disease (highest mortality rate). Studies show that several other nations spending less have better health outcomes for their people. As per a new report in JAMA, a little less than 50% of the American health care costs are for planning and controlling medical services at the executive level. Further, the nation ranks third on the list of public medical spending while it covers only 34% of its citizens in its federal programs such as Medicare. Undug patterns and trends, treating ailments at a later stage, repeated hospitalizations, and time-consuming development of new vaccines or medicines are perhaps some reasons behind this hike in healthcare costs. PHM not only encompasses disease management but also intensive care management for those who are at a considerable level of risk as well as personal health management for individuals at a lower risk of a projected health threat. Now, this requires proper coordination between the payers and providers along with tools that are beyond data capturers and reporters. Both payers and providers rely on risk scores to evaluate costs, measure literacy of a patient, and target interventions to prevent the acceleration or development of a more dangerous condition that may result in worst outcomes or higher expenses. The payers care significantly due to their financial stake but need comprehensive data-driven systems to identify and handle patients who may incur noteworthy medical expenses shortly. They need more data than what is recorded within or the walls of hospitals or clinics for taking such care. By 2016, only 6% of clinicians could access EHR data present in another system. As per a research, the more is the engagement of patients; the higher is the probability of them adopting preventive measures and reducing the chances of hospitalization. To ensure this, a study shows that using apps and online sites for communicating with health care professionals is likely to enhance engagement by at least 60%. These apps store and share data through cloud due to which the access to patient data is 24×7. Well, the latest models of these apps would be based on Artificial Intelligence, which facilitates medical consultation. Patients only need to submit details about the noticeable symptoms and health conditions. These apps would then obtain the related disease information by scrutinizing a variety of databases and leveraging features such as speech recognition and Natural Language Processing (NLP). Further, these apps would examine the patient’s profile, responses to different drugs, and past medical reports. Based on this analysis, the apps would suggest the steps to alleviate the ailment. A few apps can follow up with patients and remind them to take medicines. In short, the AI-based population health management solutions such as Al avatar and Cognitive Concierge, are making patients to take care of their health proactively. The famous EHR vendor, Allscripts, have allied with Microsoft to come up with Avenel, a creative AI-enabled, and cloud-based EHR. This mobile-first EHR shall use machine learning to make clinical documentation faster. With navigation via swipes and taps, writing notes would be handy for the clinicians. eClinicalWorks also has come up with a new EHR to be available in 2019. This population, health management software, will be showcasing diverse panels for voice interactions, decision support induced by machine learning, and telemedicine. The EHR is also likely to be a catalyst for predictive AI analytics for handling high outlays as well as illnesses such as sepsis. As the American Medical Association (JAMA) journal, a team at the University of California-San Francisco Health tested EHR’s big data to identify the source of hazardous Clostridium Difficile infections. This healthcare big data analytics happened with the use of location and time stamps over three years, which were of almost 90,000 patients. It designed a map showing the patient movement. Conclusively, it pointed to a CT scanner in the emergency department’s medical center as a significant source. These population health solutions that are leveraging such data for improving health outcomes is a big step in PHM and gives the actual advantage of digital health information. Well, this is just a trailer of AI and ML can transform the traditional EHR. Medical experts are of the opinion that the rising costs can be controlled using AI and ML. Both these technologies can help in saving costs in different ways. Exposing Hidden Patterns and Trends: According to Prashanth Kini who is the VP at Ayasdi that is a health care with machine intelligence company, the present tools for PHM are dependent on queries from analysts who wish to get the desired information from the healthcare knowledgebase. However, many trends and patterns remain hidden, as most analysists or clinicians do not ask the right query. The PHM’s dynamic and complex nature makes it handy to execute it with ML, a division of AI focusing on discovering the unseen patterns and projecting trends in prominent and dissimilar data sources quickly. It does so via the technique of unsupervised learning that examines data and learns common patterns and variances with least manual intervention. Which patients are at risk of further deterioration? Which patients would be readmitted in next one month after hospitalization? How many emergency visits will patients make in the next six months? What will be the total cost of care for patients in the next year? For which ailments, our clinic can provide better care? Accelerating Evidence-based Medicine Efforts: While evidence-based medicine is in practice, its usage is restricted due to the low processing power of humans. AI algorithms are aiding in giving a boost to these efforts by examining millions of data sources and revealing applicable patterns and actions to be taken. According to Dr. Robert Pearl who is a professor at Stanford University, AI can recommend the right mix of chemotherapy medicines when medical data recorded by the oncologist and consensus algorithms from the field’s experts are used together. AI can do so by reviewing hundreds of proven remedies or alternatives. The oncologist’s medical record usually includes the patient’s age, stage of cancer, genetics, and related medical issues. By giving the right remedy on time, AI and ML can help save much money that can otherwise go into other less effective therapies. Researchers at Permanente Medical Group of North California have also used AI algorithms for building a predictive model based on data gathered from 650,000 patients who were hospitalized. This model could find out which of these current patients would be most likely to be in the ICU tomorrow. This population, health management solution, can significantly bring down the costs of frequent hospitalizations. It also can save several lives every year. Efficient New Medical Discoveries: Making new drugs and therapies meant to end, decelerate, or reverse the effects of ailments, most of the times, need several years and billions of dollars as a valuable investment. AI and ML can reduce these expenditures and accelerate the process by boosting the efforts related to research and analysis. For example, Pfizer and IBM Watson have partnered to use AI for research on new drugs. 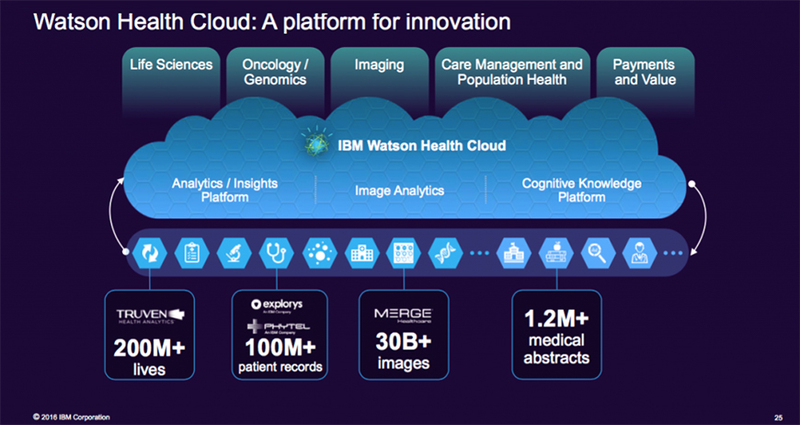 IBM is extending support through the AI’s vast computational power and ML’s cognitive knacks. This is helping in examining and testing hypotheses from over 30 million data sources, including lab reports and therapeutic literature. NLP is in use here for this analysis to find data relevant to new research. The amalgamation of care management plans and risk scores is required for mitigating adverse events. This is essential for effective population health management, for which machine learning can help. AI remembers what is learned, which makes it ideal for big data analytics models such as complex decision making or personalized medicine as per the genetics. There are also no internal biases due to which AI offers actual examination outputs about the patient. This leads the way to a simple care regimen. AI and ML can even identify shifts in data more instantly and profoundly than most humans. Thus, they can predict illnesses such as sepsis even before the individual begins to feel ill.
AI and ML also support interoperability, a term that refers to access data quickly and instantly, present on different platforms. In PHM, information is never complete in a database, application, or data center but is instead spread across these storage mediums. One such interoperability tool in existence is Fast Healthcare Interoperability Resource (FIHR), which is a data standard that facilitates retrieval of health information via an FHIR-based browser. It allows accessing data from different data sources in a uniform way. Another option for ensuring healthcare interoperability is an application programming interface (API), which can address the issue of making the data flow from the vendor system to other systems. APIs facilitate a population health management software to access the services of other such solutions. Thus, professionals can track patient data from different sources and improve care management. Connecting disparate systems through APIs enables ML algorithms to access multiple and all-inclusive knowledge bases for optimum decision-making. Partners HealthCare, Montefiore Medical Center, and the American Society of Clinical Oncology’s CancerLinQ are some ML projects that shall support predictive analytics to make risk stratification more effective by preventing risks in more patients. They are also likely to support collaborative research and decision support. As PHM is evolving towards value-based care, payers, clinics, and providers are positive for AI and ML when it comes to improving health outcomes while implementing cost-cutting measures. AI has the power to change each aspect of PHM. However, for the best results, the users of AI need to comprehend which data to fetch, use, and analyze for taking the right decision. As the population ages, PHM is maximizing both qualities of life and disease management with value-based care. Aggregating, analyzing, and reporting health data from several different sources using AI pave the way for observing how genetic, behavioral, socioeconomic, and clinical factors associate and delivering more directed, preventative healthcare outside hospitals. This is perhaps shifting Triple Aim to Quadruple Aim.